The difference between a co-borrower and a co-signer? 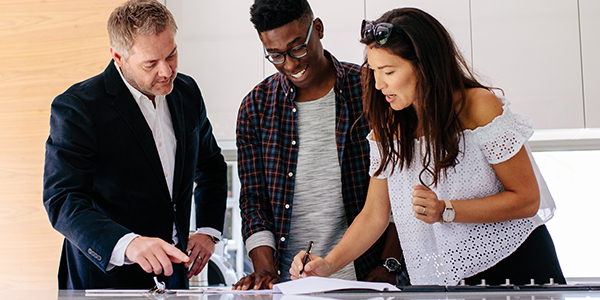 Do you know whether you’re a co-borrower or a co-signer? There are important differences between these roles that you need to know before applying for a mortgage. Co‐borrowers and co‐signers both take on legal responsibility for re‐paying a mortgage for different reasons. The rest of this blog will help you figure out which hat you’ll be wearing during the mortgage process. A co‐borrower will apply for a loan with the primary applicant. There is typically a defined relationship between the parties, typically as spouses, domestic partners or engaged couples. Co‐borrowers will have a shared interest in the property. For example, if your spouse is the primary applicant on the loan, you can also apply as the co-borrower. When an applicant can’t qualify on their own because of income or credit restraints, they may ask a family member to be their co‐signer. A co‐signer typically does not intend to make re‐payments on the loan, nor do they live in the property, but they do promise to assume responsibility if the primary applicant defaults on the loan. A co‐signer will need to understand this and know that this will be reported to the credit bureaus as a debt. For example, if you are unable to qualify for a loan independently, you could ask a parent or sibling to be a co-signer who would only take responsibility for payments if you were unable to make them. Make sure you know whether you’re a co‐borrower or a co‐signer before taking on any legal responsibility for a mortgage.